On Sunday September 23th, Girls in Gis made history with the largest event yet. 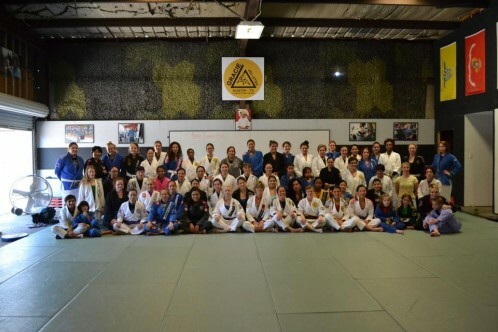 Sixty-five participants from thirty-nine different academies throughout Texas came together on the mat at Gracie Humaitá Austin in Austin, Texas. Among these women were ten beginners. This was not only the largest event in the history of Girls in Gis, but this was the first Girls in Gis event hosted by a team of females. The Gracie Humaitá Austin female team consists of Ari Burkhart, Tessa Simpson, Shama Ko, Rebecca Varady, Stephanie Nguyen, Ketra Bartek, Brittany Robertson, Shavon Moore, Marisa Miller and Rebecca Pheasant. The Gracie Humaitá girls all pitched in at some capacity to make this event a huge success. The event began with a warm up which was led by Rebecca Varady and Ketra Bartek. They did a fantastic job leading the group before the technique portion of the event. After the warm up, the group of sixty-five participants was broken up into two separate groups based on experience level. Ari Burkhart stepped up and led the beginners while Tessa Simpson and Shama Ko led the instruction portion for the more advanced participants. Ari, Tessa and Shama did an outstanding job representing their academy in principles and structure while providing a fun and friendly environment for everyone to train and learn. It was truly amazing to see sixty-five women and girls on the mats at once sharing their love for jiu-jitsu. Not only was this a testament to the growth of BJJ in Texas, but represented the unity and strength of our rapidly growing community. The event also featured fitness challenges, games and fun giveaways from Defense Soap. Other prizes included the Girls in Gis first edition t-shirt, which are available pre-order online. Thank you Defense soap for sponsoring this wonderful event and for the awesome giveaways. Check out the videos from these challenges. Thank you Gracie Humaitá Austin, Donald Park, Paulo Brandao, The GH O.G’s, the Gracie Humaitá Austin Female Team and everyone that joined us. Thank you all for making this a huge success! That’s what GIG is all about! Creating a fun, educational and memorable event that brings BJJ females in community closer together. Mission accomplished! Another great post mate! I’ve often wondered about the sblaitity ball stuff ESP as you see guys like Galvao and Leozinho do it and their jiu jitsu is amazing. I can do some of those drills but standing on that ball seems so foreign and difficult to me. I wonder if it is a black belt skill that u’ll acquire over time as your balance and body/spatial awareness improve! Anyway keep up the good work bro!